Fondue: Pronounced fahn-DOO. A Swiss dish shared at the table in an pot over a small burner. 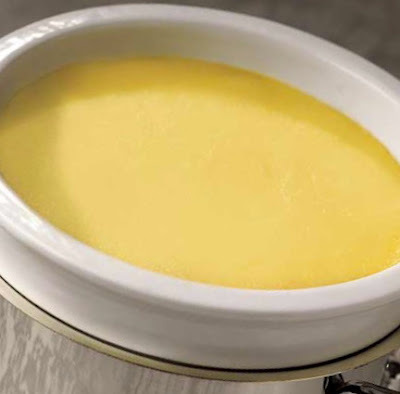 The word fondue is derived from the French word "fondre" which means "melt". Hello! I hope you had a wonderful weekend! Mine was lovely: Great weather, date night with my husband, playing with my boys, family dinner. You can't get any better than that!! I have a simple, yet knockout recipe to share with you today - Enjoy! Fondue Etiquette: Allowing your tongue or lips to touch the dipping fork is thought to be rude. With meat fondues, you should use a dinner fork to take meat off the dipping fork because it is very hot. A "no double-dipping" rule also is in effect: After a dipped morsel has been tasted, it should never be returned to the pot. 1.) Toss cheese and cornstarch together in a medium size bowl. 2.) Heat cider and lemon juice on medium heat in a heavy bottom saucepan, until simmering. 3.) Add cheese, one handful at a time, stirring well after each handful until cheese is melted. 4.) When all cheese has been added, stir in salt, cinnamon, nutmeg and pepper to taste. 5.) Cook on low heat until thickened, 3 to 5 min. 6.) Transfer to a fondue or serving pot to keep warm. 7.) Serve immediately with apples, bread and sausage. Swiss Tradition: If a piece of bread is lost in the cheese by a man, he buys a bottle of wine, and if the same thing happens to a woman, she kisses the man on her left. Oh man I think I gained 5 pounds looking at that recipe! Yummy! I've added this to my recipe file! It will be a hit for movie/game night! Who knew? Those are fun facts about the cheesy stuff. :o) Sounds tasty too! I wanted to thank you, Niki, for your kind words regarding the whole Flickr fiasco. It is a crock and hopefully I can get them to re-instate the account, even if temporarily so people can save their screenshots. Guess we'll see. Anyway, thanks again, it meant a lot.